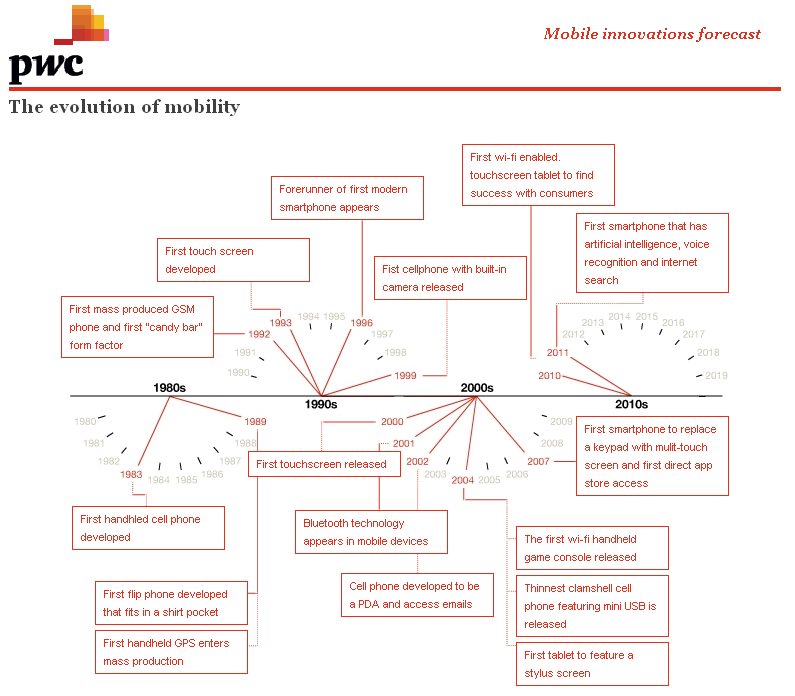 Where will disruptions in mobile innovations arise over the next five years? How will these disruptions change consumer and employee behavior? What business opportunities will result? What can companies do to take advantage of these disruptions? How do they fit into broader market trends now driving the technology sector? Device connectivity speed: Megabits per second per dollar (Mbps/$) will improve 37% CAGR, equating to four times faster in 2015 than in 2011. Infrastructure speed: average Megabits per second will improve 54% CAGR. Processor speed: GigaHertz per dollar (GHz/$) will improve 53% CAGR. Memory: Gigabits per dollar (Gb/$) will improve 48% CAGR. Storage: GigaBytes per dollar (GB/$) will improve 35%CAGR. Image sensor: Megapixels per dollar (MP/$) will improve 20% CAGR. Display: performance per dollar per square inch (P/$/in2) will improve 18% CAGR. Performance is a weighted aggregation of resolution, brightness, power efficiency and other factors. In addition to the Mobile Technologies Index, future PwC MIF articles will explore different aspects of the four-part framework, including new capabilities of emerging and existing technologies; new use cases that arise from performance improvements or entirely new mobile technologies including the extension of the mobile ecosystem into the cloud; and new business models that might increasingly rely on industry dynamics outside of the mobile industry itself. The MIF is part of PwC’s framework for understanding dynamics driving the broader technology sector. Details at: www.pwc.com/mobileinnovations. what was the methodology for this reports? thank you for sharing this report. very useful. Amazing check it out !!!!!!!!!!!!! !